Photo: Courtesy of Foodie Underground. Foodie Underground, a project curated in part by Anna Brones, explores our relationship with the origin of our eats. Motivated by an unwavering belief that food should never be complicated or pretentious, Anna — author of vegetarian and GF primer The Culinary Cyclist, is serving up everything from the best veggie BBQ to a beginner's guide to pesto. Hungry yet? Food tip of the week: Never buy granola ever again. It’s one of the easiest things to make yourself, and because it stores well, you can make up a big batch and have enough for many breakfasts to come. The other great thing about granola? 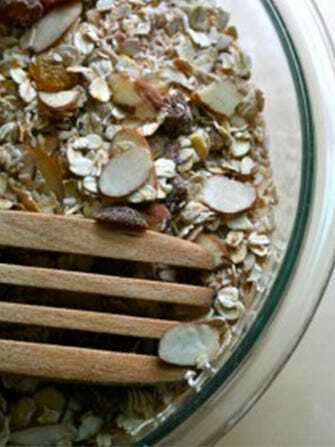 Once you have your base recipe of oats and a coating to make the granola crispy and sweet when you bake it, you can add pretty much anything you want. Chia seeds? Sure. Pepitas? Delicious. Figs? Certainly not an ingredient to ever go without. RELATED: Make Your Own Eggnog! If you want a breakfast that’s heartier, add more nuts, and if you’re in need of something sweeter, add some extra dried fruit. Combine all dry ingredients in a bowl. In a saucepan, melt coconut oil and honey and whisk together. Pour over dry ingredients and mix until thoroughly coated. Spread out evenly on a baking sheet and bake for 20-30 minutes, stirring mixture every 10 minutes. Remove from oven and let cool before putting in an airtight container for storage.